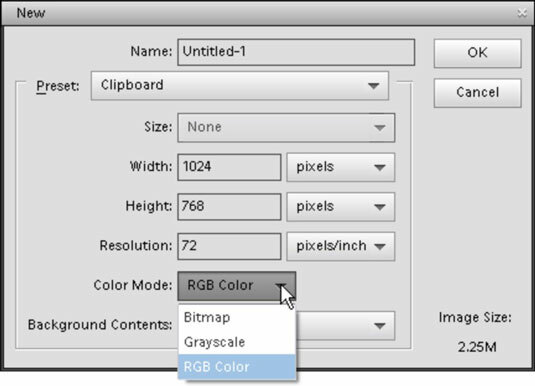 If you start in the Photoshop Elements 11 Photo Editor and create a new blank document, you have a choice for defining the color mode of the new document. Choose File→New→Blank File, and the New dialog box opens. At the bottom of the dialog box, you make a choice for the color mode from the Color Mode drop-down list. When you open an image from a digital camera or scan an image, the image file contains a color mode. Typically, digital camera images are in RGB color mode. When you scan documents and photos on a scanner, you can choose from among line art (bitmap mode), grayscale, or RGB color. Another mode you may have heard of is CMYK. Although CMYK mode isn’t available in Photoshop Elements, you should be aware of it and its uses. CMYK, commonly referred to as process color, contains percentages of cyan, magenta, yellow, and black colors. This mode is used for commercial printing and also on many desktop printers. If you design a magazine cover in Elements and send the file to a print shop, the file is ultimately converted to CMYK. Also note that most desktop printers use different ink sets within the CMYK color space. When choosing a color mode, the options you have for importing images from digital camera shots, scanning images, and creating new documents are limited to the modes discussed thus far. To explore other modes or change a mode, you have to work with menu commands for converting color.